August 30 is celebrated as Saint Rose of Lima Day in Peru. Saint Rose of Lima (Santa Rosa de Lima) is the primary patron saint of Peru, and her feast day was designated as a public holiday. Rose was born Isabel Flores y de Oliva in 1586. Her father was a Spanish soldier, and her mother was a creole from Lima. Rose was the nickname she was given in her babyhood, when a servant claimed her face transformed into a rose. Her parents wanted her to marry, but Rose was determined to take a vow of virginity and devote her life to God. She spent her entire life in severe asceticism, taking care of the poor of Lima. She almost never left her room, except for visits to the church. Rosa died at the young age of 31. In 1667, Rose was beatified by Pope Clement IX. His successor Pope Clement X canonized her in 1671. St. Rose of Lima became the first American saint. She is venerated as the patroness of South America, indigenous peoples of the Americas, Peru in general and the city of Lima in particular. Her liturgical feast falls on August 23 in most countries, but Peru and some other Latin American countries observe it on August 30, the day it had been celebrated before the 1969 revision of the liturgical calendar. 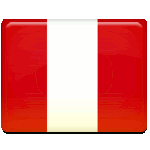 In Peru, August 30 is a public holiday.